Park Forest, IL–(ENEWSPF)– July 6, 2009. If the weather forecast is correct, our break from the summer heat will be over this week, so consider taking advantage of the ‘cool’ activities occurring this week in and around Park Forest. Senior Citizens Advisory Commission – Tuesday, July 7 at 7 P.M.
All Commission and Advisory Group meetings are held at Village Hall, 350 Victory Center. Residents are encouraged to attend. The Village of Park Forest Board’s next Neighborhood Meeting is scheduled for 7 p.m. on Thursday, July 9 at Hope Lutheran Church, 424 Indianwood Boulevard. Invited residents will be those living south of Sauk Trail, west of Indianwood and north of the Will County line. Letters of invitations will be mailed out this week to residents in this part of the community. 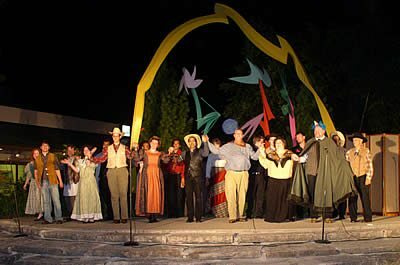 In an effort to improve communication with citizens, the Village of Park Forest implemented the Neighborhood Meeting Program in 2004. Since then, Village Officials have facilitated meetings in all neighborhoods across the community, and in most cases, have been into each neighborhood twice since the inception of the program. The meetings are held with the intent to provide residents with an opportunity to have their voices heard and questions answered by the Mayor, Village Trustees, Village Manager, Department Heads, and other members of the Village Staff. Typically, the meetings draw 50 to 100 citizens and in some cases, the attendance has been upward of 200 residents. Questions regarding the Neighborhood Meeting Program can be directed to the Village Manager’s Office at 708-748-1129. Once again, the Economic Development and Planning Department will co-host a Business After Hours with the Matteson Area Chamber of Commerce (MACC). MACC is located in DownTown Park Forest and serves the communities of Park Forest, Olympia Fields, Richton Park, Matteson, and University Park. This year’s event will be held on Wednesday, July 22, from 5 p.m. to 7 p.m. at Dining on the Green. Attendees will have the opportunity to visit many of the DownTown businesses, enjoy good food and fellowship, and win exciting raffle prizes. Park Forest residents are encouraged to attend and then stay for the Main Street Nights on the Village Green from 7 p.m. to 9 p.m. The AARP Safe Driving Class will be held in the Board Room of Park Forest Village Hall on Wednesday and Thursday, July 8 and 9. The class will be from 9:00 a.m. to 1:00 p.m. each day. You must attend both sessions in order to become certified. The classes are under the direction of AARP and are designed to update you on the driving rules. The course can qualify seniors for a discount on the liability portion of their car insurance. The discount is good for three years. The fee for this class is $12 for AARP members and $14 for non-members. Payment, by check ONLY, must be brought to class. AARP members should bring their membership cards. Call 708-748-5454 to make your reservation. Ken uses his elastic, comedic face to paint a permanent smile on the faces of everyone. Celebrate the 40th anniversary of Woodstock. 1969’s music will take you back as you find yourself dancing and singing along like its 1969 all over again. Monday, July 6 at 10:45 a.m. – Morning Story Times. Stories for children 3 to 6. Tuesday, July 7 at 8:00 a.m. – Tuesday Morning Walkers. Meet in the north parking lot. Tuesday, July 7 at 7:00 p.m. – Pajama Storytime for Children. Come dressed for bed. Wednesday, July 8 at 10:30 a.m. – Lap Sit Story Times. For children 3 and under. Wednesday, July 8 at 11:45 a.m. – Toddler Art. For children 3 to 6. A varied compilation of sculptural works will be shown by artists Joshua Andres, Patrician Bohannon, Louis Greer, John Hansen, Angela Lee, Michele P. Owens, Michael Ruback, Eric Steele, Jan Stewart, Grant White, and Robert Williams. An opening reception will be held on Friday, July 10 from 7 PM to 9 PM. Admission is free to the public. Gallery hours are 11 AM to 4 PM Tuesday through Saturday. For more information, call 708-748-3377. Jazz in the Park for Charity 2009 will be held on Sunday, July 26 at Bicentennial Park, 301 W. 203rd St., Olympia Fields, IL. Featured performers include Nick Colionne, the Afro-Semitic Experience and Ava Logan. Tickets are $50 per person and doors open at 2 PM. Ticket price includes food from local restaurants. A silent auction will also be held. Proceeds from the event will benefit local non-for-profit organizations. For more information, call 708-283-8450 or visit www.jazzintheparkforcharity.com. Tickets go on sale beginning on Monday, June 15 for the Southland Area Theatre Ensemble (SLATE) at GSU’s summer production of “Into the Woods.” The production will take place on Friday, August 14 at 7:30 p.m. and Saturday, August 15, at 2 p.m. and 7:30 p.m. Adult tickets are $18 to $21 and tickets for children under 16 are $16 to $19. Tickets may be purchased by calling The Center box office at 708-235-2222 or online at www.slatetheatre.org. Cinderella will be performed on Thursday, July 23 at 11 a.m. Summer camp groups, families and individuals are welcome. This performance provides an ideal field trip experience. Tickets are only $7 each for groups of 20 or more and $9 each for individuals. For more information or to purchase tickets, call The Center box office at 708-235-2222 or visit www.centertickets.net. 9 AM – 11 AM and 2 PM – 4 PM, Bloom Township Center, 425 South Halsted Street, Chicago Heights. Attendees should bring a copy of their phone bill. For more information or to RSVP for the clinic, call 708-672-0200. Discover what it takes to protect the environment through exploring Thorn Creek Woods. This will be a four day camp for children ages 5 – 7 years. Snacks and backpacks provided. Cost is $55 per child. For more information, call 708-747-6320. Do you know someone who went beyond the call of duty? The Commission on Human Relations is looking to honor an individual or individuals who have made an impact in race relations, good neighborliness, human relations, and/or is a proponent of diversity in the South Suburbs. Nomination forms are to be submitted by August 3. Nomination forms can be found on the Village of Park Forest web site (www.villageofparkforest.com), or by emailing Evelyn Sterling at [email protected], or calling 708-283-5621. Rain barrels have become the “must have” item for Park Forest residents. The Park Forest Environment Commission and the Park Forest Recreation and Parks Department are facilitating the sale of rain barrels for $49 each. Residents interested in buying rain barrels can visit the Recreation and Parks window on the main floor of Village Hall, 350 Victory Drive, to order a barrel in the color of their choice (terra cotta, gray, black or blue) and pick them up at the Farmers’ Market on Saturday, July 11th, August 1st or September 5th. You can also purchase a rain barrel at the Farmers’ Market with colors limited to the stock-on hand. Common rain barrel accessories will also be available for sale at the Farmers’ Market. Payment can be made in either cash or personal check. For further information, call Village Hall at 708-748-2005. Sources: Village of Park Forest Weekly Manager’s Report; State Representative Anthony DeLuca, State Representative Al Riley, Spring/Summer 2009 Calendar of Events, Park Forest Library, Tall Grass Arts Association, Center for Performing Arts, and Park Forest Historical Society websites.